Episodes of stress and anxiety are quite normal and thankfully often short-lived. When we find ourselves under longer-term stress it can become detrimental to our health and may cause us to feel anxious and unsettled for longer than is healthy. In these times it is often tempting to drink more alcohol or eat unhealthy foods to comfort us and make us feel better. This is completely understandable; however, we should try to avoid these measures as they are counterproductive and can negatively affect our sleep quality and energy levels. We would always advise our patients to talk about their stress and anxiety. People often think they are suffering alone, but these issues are very common. They might have a trusted friend, colleague, teacher or other person that they feel comfortable reaching out to, or if things are not improving then talking to a professional is recommended; a patient’s GP is a good place to start. •	Exercise – any sort of exercise is good for our physical and mental health and will leave us feeling calmer. Exercising with a friend or joining a class can have additive benefits. •	Deep breathing – this is a simple and natural way to combat momentary stress and help us feel relaxed. •	Set realistic goals – when we are stressed even simple tasks can seem overwhelming. Setting realistic goals and achieving them one by one can help to keep things in perspective. •	The power of positive thinking – when we are stressed, unhelpful thoughts and feeling can fill our minds. Do these thoughts and feelings really make sense? What helpful actions can we take in response to them? •	Avoid alcohol, smoking and other unhealthy short-term fixes – these will eventually end up making our situation and our health worse. Instead try to focus on getting adequate sleep and maintaining good nutrition. Zenflore is a probiotic which contains a culture that occurs naturally in the body. The levels of these good bacteria are often depleted due to diet, stress, pollution and illness. Zenflore rebuilds the level of these good bacteria helping with digestive issues, boosting immunity and helping with stress and fatigue. Zenflore is strengthened by the addition of Vitamin B which contributes to brain function and a subsequent decrease in stress levels. It is a convenient once daily dosage and comes highly recommended by many of our patients. Vitamin B is an essential part of nutrition needs for a variety of reasons including our mental health and gives us the capacity to help control our stress levels and anxiety. It is found naturally in red meat and green vegetables, but this Sona product can boost your daily dose of B vitamins to help you combat stressful and anxious times. In times of stress and anxiety our sleep is often adversely affected. This of course can make us feel worse, as life tends to become more difficult without getting a good night’s sleep. Melissa Dream has been designed to help us get a restful sleep. Non-habit forming, and containing Lemon balm, Chamomile, Vitamin B and Magnesium, it helps us get a good sleep in a natural, safe manner. You should take two tablets one hour before bedtime for the best results. All the ingredients will aid relaxation and brain function. A good sleep is key to fighting back against stress and anxiety. This product “comforts and reassures.” Rescue Remedy is perfect for occasional use when you know you are going to be anxious or under a bit of stress. Through its unique formulation it works quickly to ease anxiety. This is particularly useful for settling the nerves for social occasions, public speaking or a big job interview. Rescue Remedy comes in a drops, lozenges or a spray making it a very convenient option for relief of anxiety. Kalms Day and Night are another safe option that promote relaxation and natural sleep. The main active ingredient is the herb Valerian which relaxes and relieves irritability. Kalms Day has a smaller dose of Valerian, thus providing relief of stress without the natural sedation of Kalms Night. 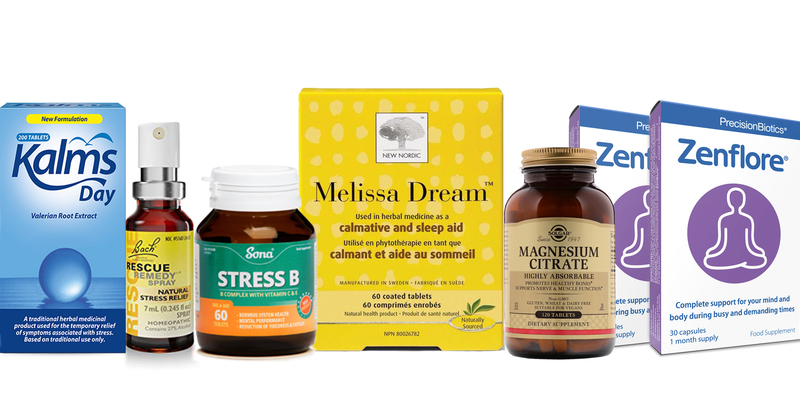 Magnesium has been shown to help with sleep as it is involved with the regulation of our sleep cycles. We need to get our rest and an undisturbed sleep if we are to be at our healthy best. Stress and anxiety can often lead to a poor quality of sleep and early waking in the morning. A dose of 200mg of Magnesium once daily can help with tiredness and fatigue which accompanies sleep disturbances.